In one of the three spaces of the new amazing building of Artlab, in the middle of the campus of the EPFL in Lausanne, an exhibition about martial arts takes place. You definitely should not miss Kung Fu Motion! Digital material and audiovisual displays are at the heart of the exhibition, which examines experimental ways of displaying martial arts. Cutting edge technologies are used to present, document, research and to communicate martial arts, as intangible cultural heritage. The first part of the exhibition takes you to the martial practices of the Southern China. 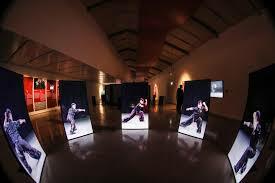 You literally enter through a video archive of a demonstration of Fujian traditions. A digital reconstruction of one of the master of the late nineteenth, early twentieth century (Lam Sai Wing) is greeting you with a taolu. You then wander into several displays aiming at both the liveliness of nowadays practice and its documentation in the past. It includes very nice displays of Hakka training practices, and a few objects. I stumbled upon the mention of Quanjing, the sixteenth century boxing treatise of General Qi Jiguang. This mirrors my own research interest. I recently wrote a case study comparing European writings about martial arts (Paulus Hector Mair) and its equivalent in Asia (Qi Jiguang). See my forthcoming article in the next issue of the International Journal of the History of Sports, entitled "Collecting martial art knowledge on paper in Early Modern Germany: The example of Paulus Hector Mair and its reading in the 21st century"
You then move to the second space dedicated to Cinema and Globalization. It looks into how martial arts are translated to the screen, with a careful selection of movies put in context. It also includes several documentaries about nowadays martial practices. There are interactive displays as well, where you can try to mimic a taolu with live motion capture of your body, laid over the original performance on a screen. You can also see a panoramic video of the martial arts performance in the Jiao festival. This exhibition is a must-see. It gave me food for thoughts for our next exhibition project about Historical European Martial Arts during the next European Games in Minsk (May-July 2019). More on this topic later. For now, book your tickets to come to Lausanne, and if you can't, at least have a look at the booklet!